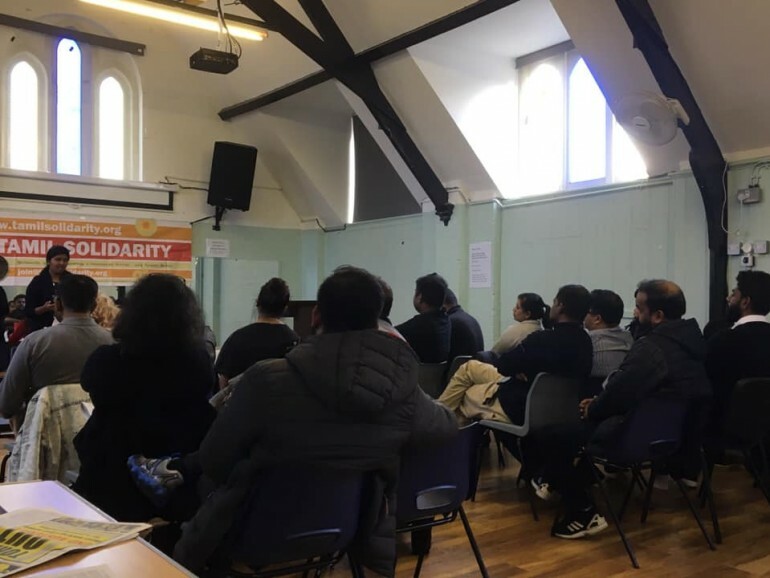 Tamil Solidarity’s annual general meeting took place on Sunday 13 January in London. Members and supporters of the campaign heard reports on all aspects of our work: a review of 2018, campaigns alongside our allies in the workers’ trade unions, Ethir media, and Refugee Rights. As a democratically run campaign accountable to the members, a detailed finance report was presented, and a new National Coordinating Committee and an Organising Committee was elected. Proposals for Tamil Solidarity’s work in 2019 were also agreed – please see below. The meeting ended with a discussion on the situation in South Asia, particularly focused on the political crisis in Sri Lanka and likely future developments, and the importance of the general strike in India. Tamil Solidarity made significant steps forward in 2018. The independence day protest and Brigadier Priyankara Fernando’s threatening behaviour thrust Tamil Solidarity into the limelight from the beginning of the year. And our profile continued to rise. The essential work alongside Refugee Rights and building Ethir and other media dominated the activity. As a result, however, it would be true to say that some of the other aspects of our work took a bit of a back seat. To some extent, that cut across the membership drive and developing our links with the trade unions. We agreed, therefore, to dedicate 2019 to building and strengthening Tamil Solidarity. At the same time, of course, the aim will be to strengthen the movement for the rights of Tamil-speaking people, in Sri Lanka, Britain and internationally. With the tenth anniversary of the genocide approaching, our aim is to ensure that Mullivaikal day is a day to mobilise the community. Yes, to remember all those who died, disappeared, were tortured or remain imprisoned – that is a key, essential part of the day. But also to fight for the living. To renew our efforts to campaign against the occupation of the north and east. To demand investigations into the genocide, war crimes and the continued oppression. To link up this struggle with our natural allies among other oppressed peoples and with the workers’ trade union struggles here and elsewhere. In addition, we need to be aware of what is taking place in Britain. The political crisis of Theresa May’s Tory government could even lead to a general election. That, in turn, could see a Labour government led by Jeremy Corbyn taking office. We should recognise that could be an important point of support for Tamil-speaking people. Jeremy Corbyn has backed the struggle for the right of Tamils to self-determination more consistently than most other MPS – he has given his support to numerous Tamil Solidarity initiatives. And his manifesto against the cut-backs to essential public services – the NHS, council services, housing, education, etc – is also very important to Tamils living in Britain. So 2019 looks set to be even busier than last year. That means we will need to get new people involved in the campaign, in the discussion groups, writing articles in Tamil and English for our websites, and raising the much-needed finance to ensure this all goes ahead. One new initiative is to produce a small newspaper that we will use to take the campaign further into the community. Everyone can get involved. So sign up! Join us today and play your part in building Tamil Solidarity, fighting for Tamil rights, and for the rights of workers and all oppressed people.